MIX cream cheese cookie crumbs until blended. SHAPE into 48 (1-inch) balls. Freeze 10 min. Dip balls in melted chocolate; place in single layer in shallow waxed paper-lined pan. Decorate with remaining ingredients to resemble snowmen. To easily coat cookie balls with the melted chocolate, add balls, in batches, to bowl of melted chocolate. Use 2 forks to roll balls in chocolate until evenly coated. Remove balls with forks, letting excess chocolate drip back into bowl. Place balls in prepared pan; let stand until chocolate coating is firm. If any melted chocolate remains after all balls are coated, store in tightly covered container at room temperature until ready to use for another use. 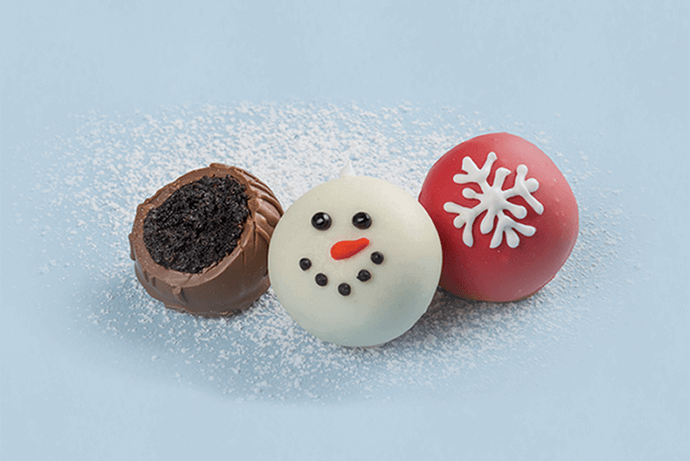 Try our other Holiday OREO Cookie Balls. Substitute semi-sweet chocolate or milk chocolate for the white chocolate. Or, tint white chocolate with red food coloring before using to coat cookie balls. Drizzle with additional melted chocolate or icing as shown in photo.